Just came across American band Loma via KEXP, anything Cheryl Waters recommends usually works for me. I was impressed enough to traipse through. First time at the Hug & Pint too and I’m pleased to say I was definitely impressed by both! Atmospheric and sensitive, beautiful moments, usually delicate, sometimes gritty, always absorbing. I’ve been interested in seeing Sylvan Esso for ages, nearly did while in the USA last year, but sunny Leith was too good to resist. Not my usual bag, but their unique quirkiness and enthusiasm is infectious. And lots of others are getting on board, hence their growing popularity resulting headlining Hidden Door festival at the lovely Leith Theatre, a memorable feature of my youth. Not feeling that well, I rolled in late and left early. Enough to see the packed house having a great time and see just how well Amelia and Nick brilliantly and charmingly work a big audience into a dancing party frenzy! I’m not a fan of so much programmed music though, however well manipulated live, so not really for me but definitely fun. Loud, shouty, grungy, punky … I think there must be more to Bully, the essence that piqued my interest and got me along, but I’m not getting it tonight. An impressive noise and lots of committment but nothing special or memorable for me. That doesn’t mean you wouldn’t like it … just not for me on the night, and I’m absolutely certain they don’t care what I think! All about singer, songwriter and guitarist Alicia Bognanno, the band have come a long way from Nashville. Many marks out of 10 for sheer attitude, good luck to them. I had seen Susanne twice before quite recently, both lovely solo shows, but I was determined to get the full band and audio/visual experience she had only shown in Norway. The premise was for her to play her latest album ‘Music For People In Trouble’ in it’s entirety from start to finish, but with a unique massive visual overlay, as much art installation as concert. So glad I persevered and got a seat right in the middle at the front. I was justifiably excited! This show was originally scheduled for Shepherds Bush Empire in February, but re-arranged. I bet it was to move this very special event to a more suitable venue since this was being filmed, hopefully out on DVD soon! And the move was fully justified, The Barbican being a superb theatre for acoustics and enabling the amazing see through screen in front of the performers for the incredible front projected images of digital moving art and performance footage. The effect was absolutely stunning. Susanne and the band played the show in sombre black hooded cloaks. No audience interaction and the songs were pretty much segued together as on the album. Included were the same spoken interludes but with longer musical sections with more free jazz style improvisations featuring saxophonist André Roligheten and bassist Petter Eldh from Gard Nilsson’s Acoustic Unity trio. I was also completely made up to see Susanne joined by Gunhild Kristofferson and Megan Kovacs (of Bow To Each Other) for their gorgeous harmony vocals and keyboards. Though I think a few in the audience were thrown by the very long sax, pedal steel and double bass solos (not me) I was spellbound and gripped by the astonishing visual display on top of wonderful performances of some of my favourite songs. Susanne is never less than perfect and manages to sing the songs differently every time, a special singing talent as well as being a great songwriter. There were hardly any pauses allowing applause during the show, but when the last notes of a brilliant version of Mountaineers rang out and after the spoken outro the audience jumped to their feet for a standing ovation and two ecstatic curtain calls. One of the shows of the century for me. Unforgettable! I’m a big fan of support band Kagoule, having seen them twice before, so a trip to Glasgow including a look at Drenge was well in order. Kagoule were really good as usual, but suffered a bit from support band sound syndrome, Lucy’s bass too loud and I could hardly hear guitarist Kai. Anyway, I like their new songs and hear a new album is coming soon called ‘Strange Entertainment’. I’m sure it will be that, but in a good way! Drenge have been around for a while, since 2010, but have not toured in the last few years so the backstage banner said ‘Drenge presents – Grand Reopening’! Focus is all on vocalist and seeming leader Eoin Loveless, and I had heard of them originally as a two piece, now with added bass and guitar/keys. I found them interesting, but not knowing the songs well I wasn’t that engaged. Hard to categorise their songs too, no bad thing, one minute garage/indie, the next more straightforward rock. Not bad, but not quite my cup of tea. Half Formed Things are a precious discovery of a new band for me, but I think Karen loves them even more! They have been building quietly since we saw them last year, which seems to be a careful and thoughtful approach, this show was a break from recording their first album. A short set, which couldn’t be more tantalising since the album will be special judging by the songs showcased. The band have added another singer Nici and her voice works beautifully alongside Morgan’s. But the balance of songs tonight seemed to feature Matthew’s singing and I was impressed as always, particularly during the stunning cover of ‘Hyperballad’ by Björk, one of my favourite songs. Imaginative but powerful drumming from Stewart is another key feature of their sound. Dramatic, Cinematic, Arty, Proggy, all sorts of words used by others to describe their take on Quiet, Loud, Quiet, Loud. Like Pop, but so much bigger! You’ll have to listen for yourself (see below incl. new single February). We will be doing much more of that later this year. This is not really a review, because I was actually in the band playing the bass guitar! My first proper gig since Oct 1989! I’ve been so lucky to hook up with a great bunch, not only smart, fun people, but great musicians, who share my passion for the indie music of our youth and take great delight in re-interpreting those songs. I couldn’t be more chuffed with how well it’s turning out. 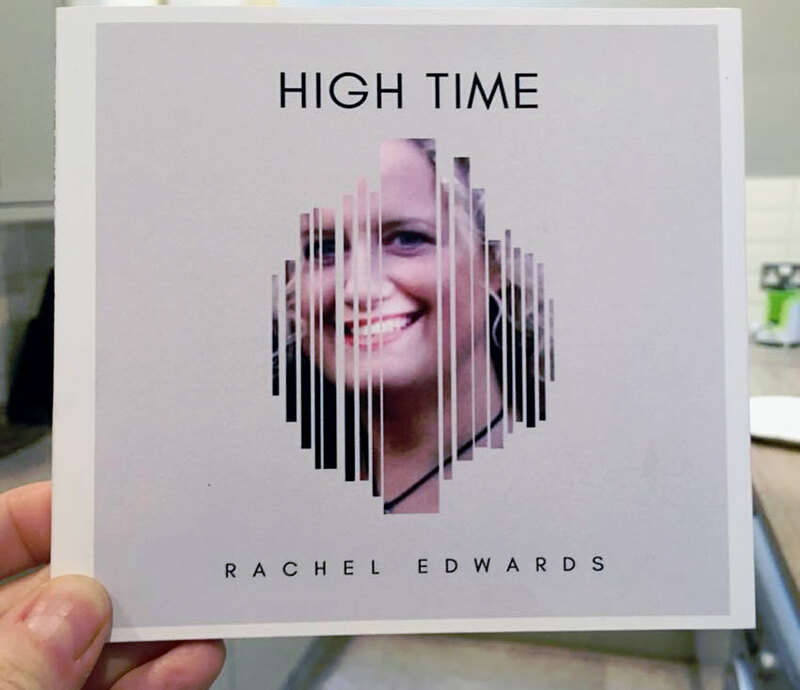 I’ve just finished arranging, engineering, recording, programming, playing the instruments, mixing and producing a 5 song EP and CD for a lovely singer and friend Rachel Edwards. I’m very proud of Rachel and our results … so brave to tackle such ambitious songs for a relatively inexperienced singer, but she did a great job to show she has ‘the voice of an angel’! Have a listen below. I think it sounds great and I owe lots of thanks to : Kornelijus Pukinsis for his amazing Alto Sax On ‘New York State of Mind’; Claire Hunter for lovely Violin touches on ‘Tell Me On A Sunday’; Mac Walker of http://www.anotherangle-Scotland.com for the beautiful artwork; Barry Gardner of http://www.masteringmastering.co.uk for a superb mastering job; and my wonderful mix review panel of Piotr, Jan, Neil, Chris, Dave, Stuart for their wise counsel. But especially Rachel for her infectious enthusiasm and my wife Karen for patiently putting up with me during all the long hours. If you have any ideas or dreams for recording your own music that I could help you with, read more on my Music Producer page and feel free to get in touch via the contact form. Would be great to hear what you think and any ideas you might have! Getting on for … ahem, 30 years since our band AVO-8 supported The Darling Buds around the UK on their 89 tour. Jan pointed out that back then, we never really got to watch them properly, so we put that right since they have reformed in recent years for a new ‘Evergreen’ EP and gigs. Well Andrea and Chris are still there from the original line-up so it was great to see them and say hello, even hugs with Jan! The Lexington is a great wee venue, been there twice before, and it was sold out solid with happy Buds fans singing all the words and throwing confetti just like the old days. They played a very completist set for an hour with all the hits and Andrea was on top form, she hasn’t changed a bit. Such a warm fuzzy, funny night of nostalgia and banging good tunes … magic!